It took me awhile to “get” kale chips. And by awhile, I mean years. My lack of love for the crispy little snack had to do with two things: 1) Misguided expectations and 2) I wasn’t making them correctly. But now, that’s all changed. In my quest to get my crispy-food-loving toddler to eat more vegetables, I set out to master kale chips. Even better, my wonderful CSA farmer has been supplying bunches of fresh-picked kale in droves. So my oven has been a kale-chip-makin’ machine, and I’ve learned to absolutely love kale chips in the process. Even better, so does my kid! Victory all around. First, let’s set some expectations. Crunchy. They are really too thin to have any crunch. Just like potato chips, but, you know, not fattening. The fact is, they are nothing like potato chips – they don’t taste like them, and they don’t have the same texture. But they are addicting. Thin, crispy, and light as air. Seriously – they will blow away in a light breeze. I know this to be true by experience. A bit of an acquired taste. They still have a bit of a “green” flavor to them, though mostly they taste salty (especially if you overdo it like I tend to do). Easy. From garden to salty snacking in 15 minutes, if you desire. Really, really addicting. Have I mentioned they’re addicting? I generally use two types of kale for my kale chips. Lacinato kale (also known as Tuscan kale or dino kale) is blue-green, fairly flat, and looks almost leathery – kind of like what you’d expect to see if you were to pet a Brontosaurus (and how cool would that be?). Curly kale is pretty self-explanatory, with tight, ruffled leaves and a slightly more bitter flavor (though I think they taste the same once they’re chippified – that being an official term). 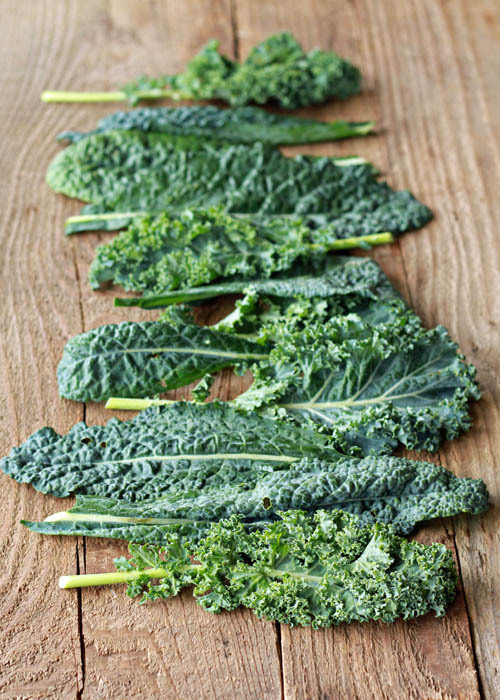 Give the kale leaves a good rinse and lay them in a single layer on dish towels or paper towels. Roll them up and gently pat them until they’re as dry as you can get them. Using a paring knife or, my favorite, kitchen scissors, cut the ribs out of the kale leaves and discard them (the ribs are very bitter). Then trim each leave into approximately 2-inch sections (some will be smaller – no worries!). 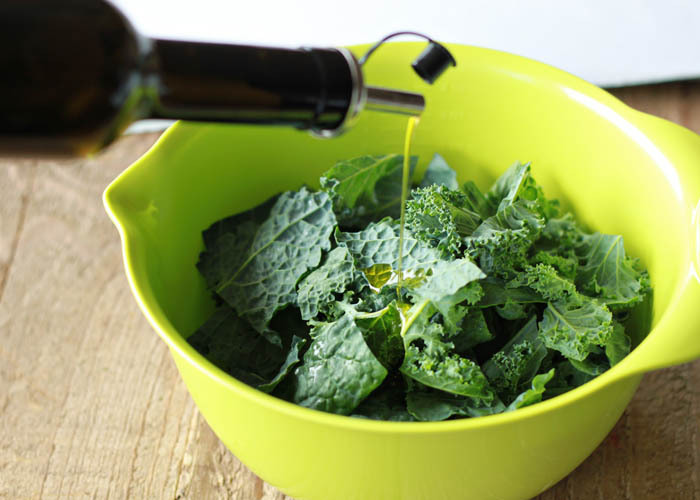 Place the kale into a large bowl and drizzle with olive oil – I use about a tablespoon per medium bunch. And toss gently, but thoroughly. You don’t want to bruise the kale, but you want to make sure every single bit of every leaf gets coated. 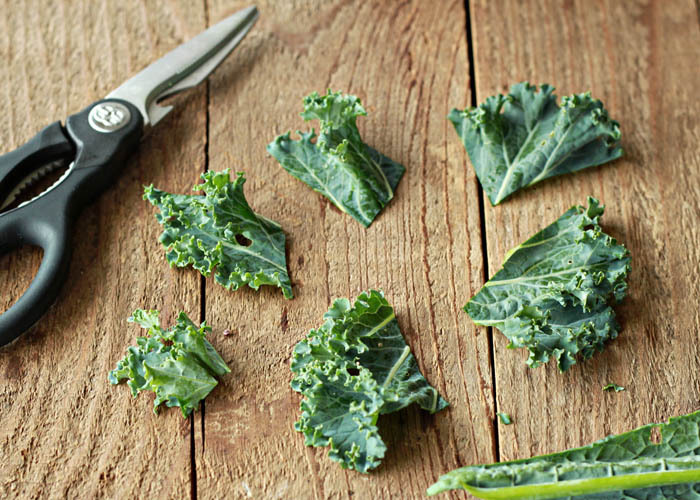 Curly kale, with all its ridges and valleys, might take a little extra effort. 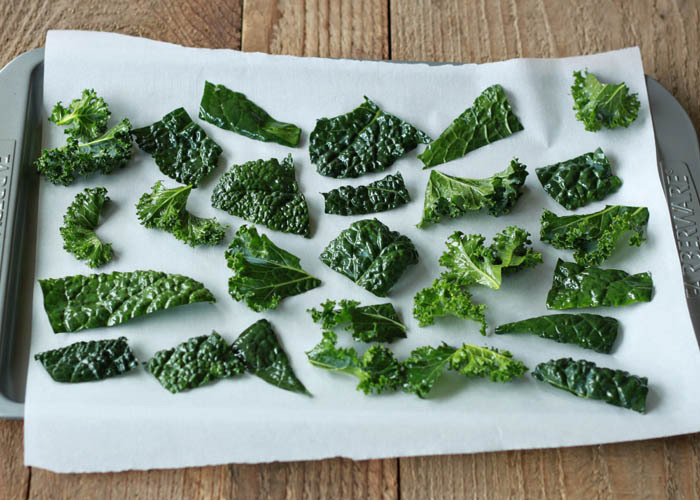 Line a baking sheet/cookie sheet with parchment paper or a SILPAT mat and lay kale in a single layer on the mat. Sprinkle with a bit of coarse salt (I use kosher salt) as desired. Place the kale in a 300 degree Fahrenheit oven and cook for 8 – 12 minutes, depending on your variety of kale. I find that Lacinato kale gets crisp in about 8 minutes, while curly kale takes more like 11 minutes. But no matter your variety, check it early! As soon as the kale is rigid and crisp, remove it from the oven. It’ll burn quickly. And if it isn’t yet crisp, keep baking, checking every couple of minutes until it is. Let cool for about 30 seconds or so, then you can start snacking! But be warned – once you start, it’s kind of tough to stop. But, hey – there are worse foods to be addicted to, no? Here are instructions in recipe form (with a print button). Now go get (healthy) snacking! Bake for 8 – 12 minutes, just until crisp. Start checking at 8 minutes – don’t overcook or they’ll burn! I find that Lacinato kale cooks faster than curly kale. 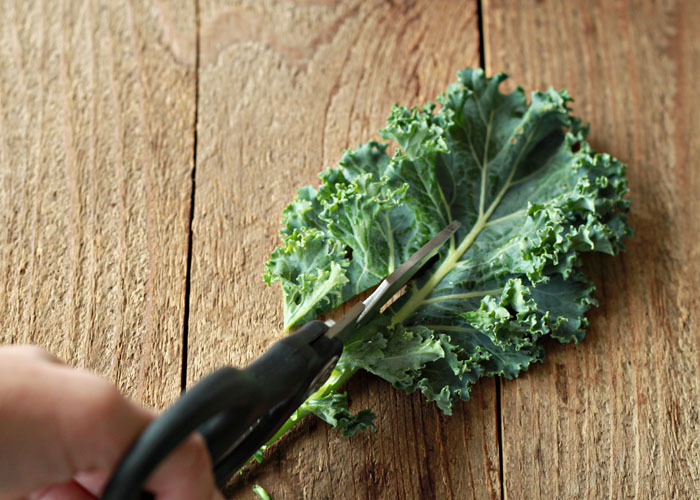 If your kale isn’t crisp after 12 minutes, keep baking until it is – check every couple minutes. October 3, 2015 – I’ve just added a star rating system to this recipe so if you have tried it, please be sure to rate it to let others know how you like it – 5 if you love it, 1 if you don’t (but hopefully you love it!) Just click on the stars below the “Print Recipe” button above. Thank you! Awesome! No other words needed. But I’ll say some anyway….I want to begin eating healthier. I saw a friend post a pic of her homemade kale chips and thought I’d give it a try. Saw your recipe, tried it and LOVE them. You were so right about them being addictive! I’m so excited about my new found healthy snack & I will definitely be trying other flavors. Thanks! I tried this easy recipe but I feel horrible for I didn’t love it and all the world is raving about it… 🙁 They are crisp and they are healthy and i am all about health in my cooking and eating. I just don’t like the taste and the after taste at all, not addicting as everybody says… I feel bad because i know i should love them for their benefits… it’s just making me want to gag… what is wrong with my kale!!! and the most important what is wrong with me? Try the teriyaki sauce/marinade maybe they will like the kale chips then. Great recipe! And you were right, can’t stop munching! So glad you liked them! Totally addicting, right?! These are fantastic! I just made a batch with cajun seasoning and it tastes incredible. As an eye doctor I’m always telling patient’s the importance of eating leafy greens like kale and I think this recipe is a great way to get people to start eating more kale! 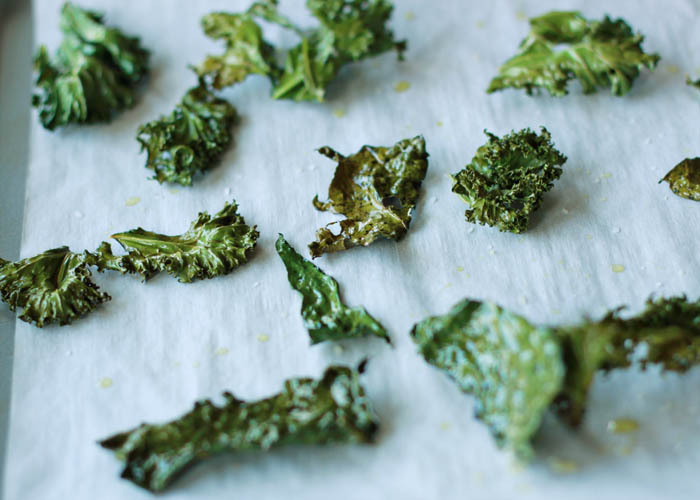 Cajun kale chips need to get into my life immediately! LOVE that idea. Thanks, Jen! Thanks so much, Tazmin! I love the idea of using coconut oil – and whole fruit powders?! Genius! I sprinkle mine w/ pepper flakes because here in New Mexico, we like a kick! I have made them w/ sesame oil & sprinkled them w/ sesame seeds. 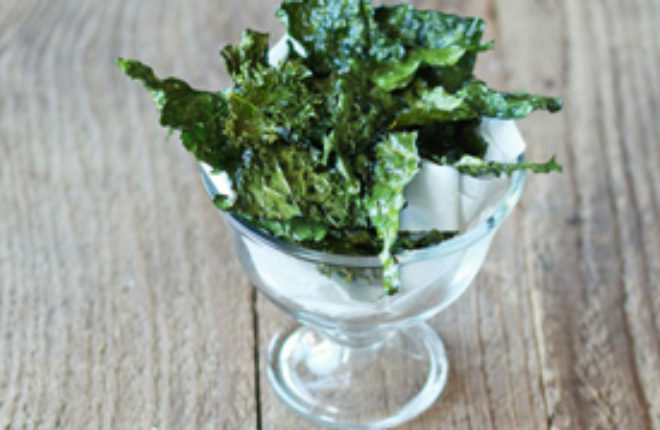 I have never had kale chips of any kind but heard that this superfood made a fabulous chip. I found your recipe and decided to give it a try. My husband was quite skeptical but I just pulled the first batch out of the oven and he’s hooked! They’re light and crispy – almost melting in your mouth…delicious! Thank you for giving my family a healthy alternative to the unhealthy store bought potato chips. Your “many attempts” wound up sparing me the same…thank you…they are simply delicious. I am already thinking of all the variations. Hubby just tried our first batch. Of course, he always does things his own way. These were a bit salty, a bit greasy, and he placed them too close together to be consistently crisp but still I found myself reaching for another. Not bad at all! Thanks for a great recipe. He sprinkled the second batch with Tony Chachere Cajun seasoning. Will try Swiss Chard next. Thank you for your instructions and care in the detail. I only made one change, I did not directly add oil to the kale in the bowl. Using a small side dish I put three table spoons of olive oil in it, I dipped the tip of my finger so as to get about a drop on the end, than rubbed finger and thumb to get some of the oil from the finger onto the thumb, I had more than a table spoon left after making 12 trays of chips. Using a convection oven, the time for baking was 20 minutes total. The spices in recipe created a fantastic flavor. great kale, 1Tbsp a little salt and at 300 for 12 min! I’ve never thought to use scissors, but am going to definitely try that next time. Thanks for the thoughtful instruction! Beautiful post! 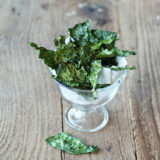 I think Kale Chips are a perfect gateway recipe for those hesitant to try kale. They are so good. Do I refrigerate the leftovers or what is the best way to keep them fresh also how long do they last? I’ve kept them in an airtight container at room temp for a few hours, but they start to lose their crisp. They really don’t keep for all that long – sorry! Amazing photography ! Thank you for saying they aren’t crispy… everyone acts like they are a chip substitute. Tasty but no substitue! Thanks so much, Krayl. 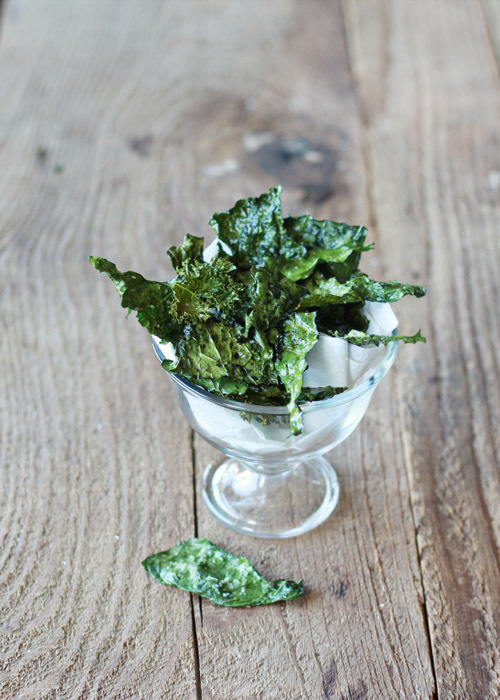 Yeah – when I first ate one, I was all: “This tastes NOTHING like a green potato chip! Not cool!” But they are definitely delicious of their own accord. Mine are always crispy. And delicious. Although your post made me try parchment paper and omg, best batch yet. I am addicted. Great pics and recipe. Gonna try today. Not often do we get kale in my city in India but found some yesterday so looking forward to cooking it. Just searched online for recipes for kale chips. Tried your recipe. Not bad. Next time will probably cook for a little less time and add a little less salt. Good alternative when you want crispy and salty snack, but not processed potato chips. These are AMAZINGLY DELICIOUS! This was my first attempt at making these and I can’t believe I haven’t tried before. I added some turmeric, salt, pepper and garlic salt to the olive oil mix. Beyond yummy! New favorite addiction!!! Thanks for the easy to follow recipe! The best recipe by far…I tried 3 others,.. limp/soggy …I raised to 300 and cooked up to 15 min and turned it over and switch tray from top to bottom…soooo good. Tried em. Love em! Will make on a regular basis. Trying different seasonings with each batch. Thanks for sharing this with us. HELP!!! Someone gave me a huge bag full of kale fresh from their garden. Don’t know exactly what kind of kale, but it’s curly. I thought this would be a perfect chance for trying kale chips, which I recently saw on Rachael Ray. Guess I need to say I’ve never tried ANY kind of kale before. So, I proceeded to wash it to get out any remaining grit, and to my surprise, there wasn’t much. Now comes the really frustrating part. I started at noon today, and it’s now 6:30 P.M. HOW do you get this stuff dry? I laid it out on paper towels (using up most of a roll), then changed out the (still very damp) paper towels, and I’m STILL waiting for them to dry. At this rate, I’ll be up all night!! Please help, in case I ever get another try!!!! 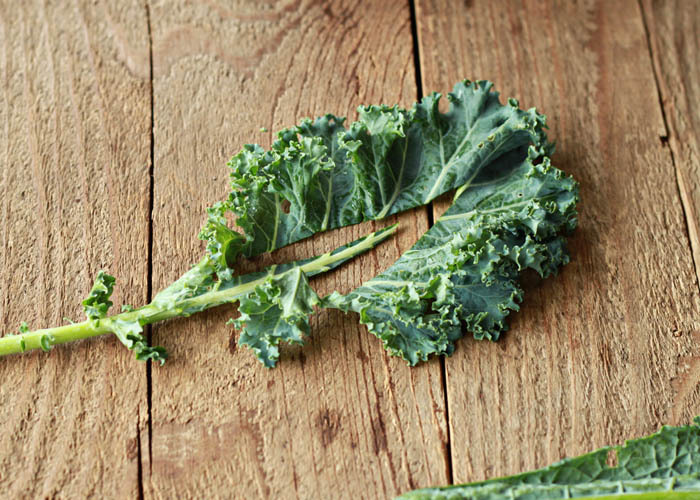 The beauty of kale is that you can be really rough with it! Don’t worry about bruising the leaves, pat it heartily with paper towels. You can also use a salad spinner of course, but in lieu of one of those, another way to get greens really dry is to layer them in a plastic grocery bag with paper towels, grab it by the handles, and swing it in vigorous circles. You’ll feel silly but it works! Just make sure it’s a sturdy grocery bag. Flying greens happen; I know by experience. Thanks for the recipe. It was much much cheaper than buying the already mad. I did add some Hidden Valley ranch packet to it. Delicious and my babies love them as well ? Thanks for the recipe. It was much much cheaper than buying them​ already made​. I did add some Hidden Valley ranch packet to it. Delicious and my babies love them as well ? 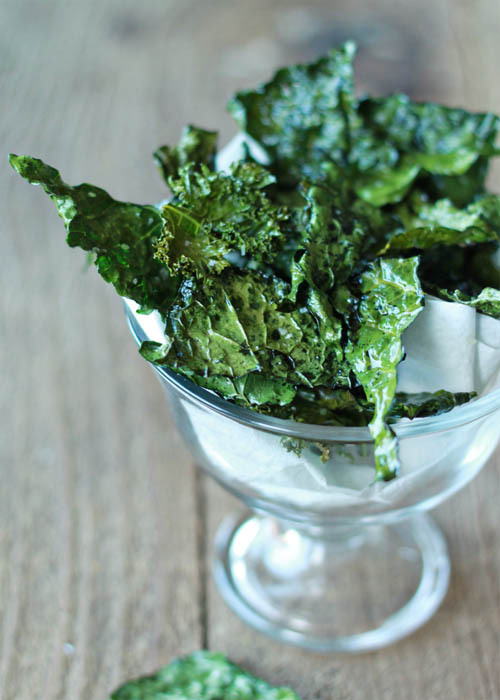 That is fists time to prepare kale chip is fantastic crispy and delicious. Thanks you.